The primary task in drawing districts is to draw legal districts. To help you assess how well you are achieving measurable legal requirement, we display plan level and district level statistics in a right hand pane of the Step 2: Draw window. By plan, we mean summary statistics for all the districts on your map. By district, we mean each individual district. These statistics are updated with each change made to a plan. The available statistics are dependent on the available data. Please keep in mind that the available data is limited to those provided by the Census Bureau and what other data can be merged with the census data. The administrator will provide default plan and district statistics to display with your plans. We also enable you to create your own set of district statistics from among a list defined by the administrator. The statistics pane has two important set of statistics. Plan statistics appear at the top and district statistics appear in the bottom. The default statistics that you will see may vary, as they are selected by the administrator. You have the ability to customize your district statistics. The name of the plan you are editing is at the top. In this example, it is the "Mike's Congressional"
A score is a measurable statistic that is defined by the administrator. In the example provided, there are scores for how many districts are near the target population, how many districts are contiguous (i.e., all parts connect), and how many districts are achieving benchmarks for racial representation consistent with the Voting Rights Act. A target is the value for a score. Each district is evaluated to see if it meets the target. For example, the target value for the Black VAP (voting-age population) Majority score is 50% or more. Districts are the count of districts that satisfy the target for a score. Provided in parentheses next to this count are the total number of districts that must reach the score for the plan to be considered a valid plan. In the example provided, there are 11 total districts. All must have equal population and be contiguous, for the plan being drawn to be legal there must be 11 districts that satisfy these scores, or "(of 11)". Only a certain number of districts must be drawn to have a target minority population that may satisfy the Voting Rights Act. In this case, the administrator has determined that there are 1 Black and 0 Hispanic districts with a minority percentage above 50% voting-age population that must be drawn that may satisfy the Voting Rights Act. Thus, the number of districts that the administrator has determined must be drawn are 1 or "(of 1)" and 0 or "(of 0)", respectively. We are careful to say may satisfy the Voting Rights Act because the Voting Rights Act is one of the most complicated aspects of redistricting. The courts have found many state and local plans in violation of the Voting Rights Act. We are trying to provide you with guidelines to draw a legal redistricting plan, but without exhaustive legal and statistical analyses that are well beyond the current capabilities of any redistricting software, we cannot know if your plan will comply with the Voting Rights Act. We hope that if you can draw at least the minimum number of minority districts satisfying the target, so your plan can be taken seriously by policy makers. We encourage users to try to draw more minority districts than the number provided by the administrator. University of Virginia students using our software were able go beyond the minimum provided by the administrator for their state Senate plan submitted to the Virginia Redistricting Competition. They thereby revealed that it may be possible to enhance minority representation in that legislative body, a fact that no one knew before. If more people draw districts, we hope that more opportunities to improve representation for all Americans will be revealed. District statistics are displayed below the plan statistics. District statistics are statistics that are associated with each district. On the left hand side is the number associated with each district. Unassigned geography is given district number zero. When working with a large number of districts, as is often the case for a state legislative body, it is not be possible to display statistics for every district at once. If there are more districts than can fit within the pane, there is a slider bar that allows you to scroll through all the statistics. 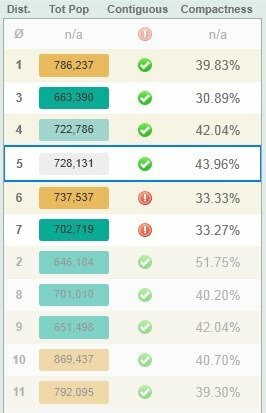 When zoomed all the way out such that you can see the entire state, all the districts will be order sequentially in the district statistics. As you zoom in to work with a group of districts, we promote the visible districts in the editing area to the top of the district list. The non-visible districts are ordered below the visible districts and are grayed out. In the example above, districts 2, 3, and 8 are not visible in the editing area. Clicking on a district in the Statistics Pane will highlight the district in blue on the Statistics Pane and on the map. This may be useful when locating small non-contiguous geographies assigned to a district, such as streams or road medians. The available statistics are chosen by the administrator and are dependent on the available data. Typically, these statistics will include the ones in the example, above. Here are some descriptions of the commonly available statistics. Tot Pop refers to total population. We shade the number in a similar manner as the districts, when districts are colored by their how well their total population achieves population equality, which is a redistricting requirement. In the example, the target population is 727,366. Districts above this value have a total population shaded in gold and districts below this value are shaded in blue/green. Contiguity means that all geography within a district connects. We do a simple check to see if this is true. If so, a district has a green check mark. If false, a district has a red exclamation point. There are many ways to measure compactness. Typical compactness measures compare a district to a circle, which is considered to be the most compact shape. We use one such compactness measure called the Schwartzberg measure, which compares the perimeter of the district to the perimeter of a circle with the same area as the district. The Schwartzberg measure ranges from 0% to 100%, with more compact districts having a higher value. To determine compliance with the Voting Rights Act, we provide voting-age population percentages for various ethnic and racial subgroups. We also provide these percentages for the total population. See the Data Guide for more information about how these statistics are constructed. To measure the political character of districts, we provide election results for various offices aggregated into a plan's districts. Election results may not be available for some states and only some elections may be available where they are provided. See the Data Guide for more information about how these statistics are constructed. Due to space constraints, only a limited number of district statistics can be shown at any one time. You can change the set of statistics by using the pull down menu at the top of the statistics pane. The administrator will make some statistics available, usually called "Basic Information" and "Demographics". And, you can create your own, such that the "My Stats" set by using the Stats Picker. 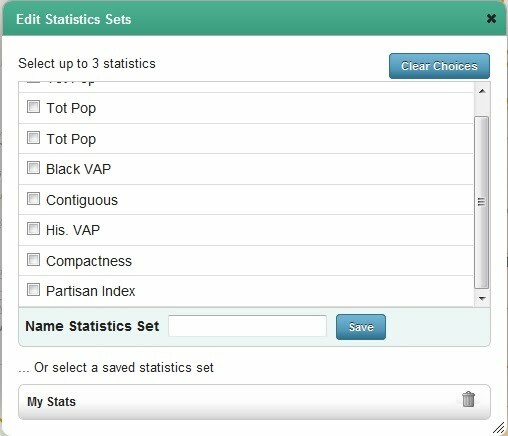 In this case, the customized "VAP demos" statistics set is available. Click on the "Edit Stats" button. The Edit Statistics Sets window will then appear. Select up to 3 statistics by clicking on the check box next to the desired statistic. A scroll bar is available if all statistics cannot be displayed in the Edit Statistics Sets window. You may select fewer than 3, but cannot select more than 3 statistics. You can clear all your currently selected statistics by clicking the "Clear Choices" button. Give your statistics set a name and click "Save". If you are successful, you will return to the Step 2. Plan editing with the statistics pane populated by your new statistics set. To edit an existing statistics set, click on the name of the statistics set in the list at the bottom of the Edits Statistics Sets window. You can modify your statistics set or make a copy by giving it a new name. When satisfied with your changes, click "Save". 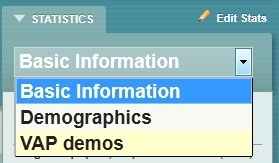 To delete an existing statistics set, click on the garbage can icon next to the statistics set name.